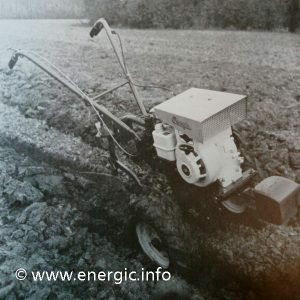 In the late 70’s early 80’s, the brand Energic was just keeping its head above water against the stiff competition – now domestic competition. 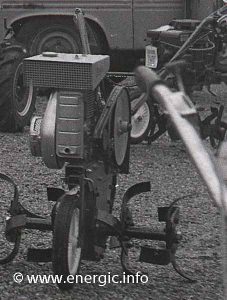 They produced a multi-functional machine capable of a multitude of tasks from Motobineuse, Motoculteur, Motofaucheuse toTondobroyeuse. It came in a range of 4 different option moteurs dependent upon the type of usage, size of terrain, etc. 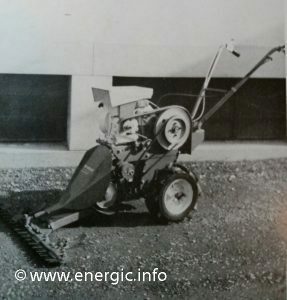 Energic Motobineuse L53/L56 with Briggs & Stratton moteur 127cc or 206cc. Engine/Moteur. L56 Briggs & Stratton, type 130200, single cylinder, 206cc, 5 cv, 4 stroke, petrol. 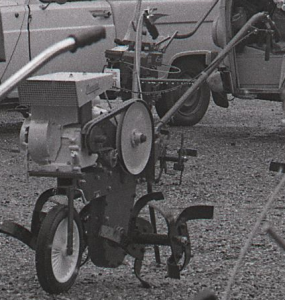 (same moteur available in the Etoile Motofaucheuse range). Steering.Handle bars, which are regularable for height and lateral movement. Box of transmission/Carter de transmission. Consists of 2 pieces. Firstly main section in bronze and secondly the box for the lateral blade/lame which is attached by. Fuel consumption. 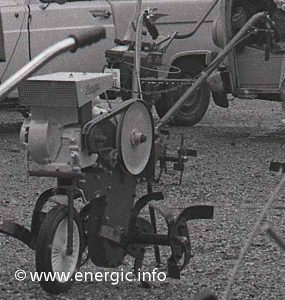 1.5 to 2 liters of fuel per hour dependent upon working conditions. The tank holds approx. 2.5 liters. 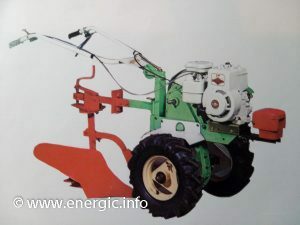 They all could be transformed into a Motobineuse (rotivator), Motoculteur (plough, hoes etc. 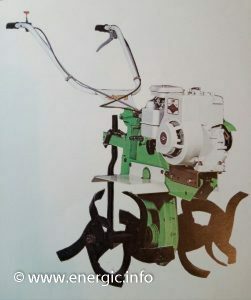 ), Motofaucheuse (grass cutting) or Tondobroyeuse (grinding machine). 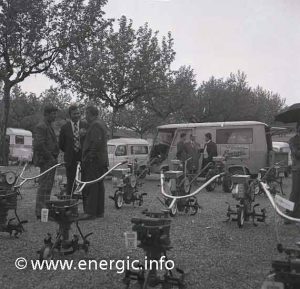 Energic stand at a agricultural fair/comice late 1970s/early 80s. With the L 50 moteured range of machines to the rear. The Briggs & Stratton moteur on the left hand side and the ILO moteur on the right hand side.